Video clip synopsis – Charles Todd dreamt of constructing a telegraph line through the heart of the continent. Broadband MP4 todd_bb.mp4 (17.3MB), suitable for iPods and computer downloads. 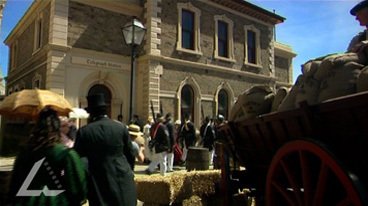 Todd’s Telegraph Dream is an excerpt from the film A Wire Through the Heart (55 mins), the third episode of the three-part series entitled Constructing Australia, produced in 2007. London born son of a grocer and tea merchant, Charles Todd demonstrated very early his ability in mathematics and astronomy. At the age of 15 he gained a junior position at the Greenwich Observatory. The observatory was experimenting with the use of the electric telegraph to transmit time signals, and Todd was fascinated by the potential of this new apparatus. In 1855, when the government of South Australia decided to employ a superintendent of telegraphy, Todd was recommended for the position. When Charles Todd arrived in Adelaide, the British Empire was at its zenith, and young men were flocking to the colonies in search of adventure, fame and fortune. The mother country was six months by sea, and Australia it seemed was six months behind in news and fashion, scientific breakthroughs and new technologies. Todd, a mathematical talent, took up the position of Government Astronomer. But his fascination for the telegraph, the newly emergent communications technology, soon led him to link a wire from Adelaide to Port Adelaide, cutting information travel time from one day to one minute. The electric telegraph is based on a simple technology. Connect one end of a wire to a battery or other electric power source and the other end to something to show that current a flowing, like a light bulb, and then earth it. At the battery end, attach a simple switch, and use it to connect and then break the electrical circuit. Almost instantaneously the light bulb will go on and off. By using Morse code to turn the light on and off watching the light bulb, you can easily send complex messages over long distances. Remembered for his role in constructing the remarkable overland telegraph, Todd also made an important contribution to connecting Western Australia to the telegraph system in the 1870s, and to the development of scientific meteorology in Australia. Research and draw a map of the main features of Adelaide around the time Charles and Alice Todd arrived there in 1855. Find out more about Adelaide and its population in the mid-19th century, then write a short general description of colonial life at that time for most of the city’s citizens. For example, what were the main choices and types of employment? Was Adelaide a violent, male-oriented, heavy-drinking society? Was life for women difficult? Was Adelaide primarily made up of British-born subjects? Did it attract immigrants and former convicts? Place yourself in the shoes, metaphorically, of a young married Englishwoman such as Alice Todd, arriving in the Australian colonies in 1855, knowing that when you post a letter to your family in England it may be nearly a year before you receive a reply. Plan and write a set of personal diary entries about your feelings, perhaps your sense of separation, and your excitement at the awareness that the next mail ship, carrying news from home, is approaching port. In pairs or small groups carry out some technical research then plan and create an illustrated magazine article aimed at young teenagers on how telegraphic messages are transmitted and received. You will need to include a description of how Morse code works. The general thrust of your article may be how the telegraph was an essential forerunner of modern computer and internet telecommunications, without which, where would we be today? Before the coming of the across-Australia telegraph in 1872, much shorter, more local telegraph lines had been built in various parts of the country. In pairs, carry out research into the early history of Australian telecommunications and write a report on when and where other telegraph lines were constructed prior to the 1870s, whether any of them were inter-linked into networks (or in fact if it was even possible to link them), and whether they were state-owned or privately financed and owned (for example, by newspaper proprietors).